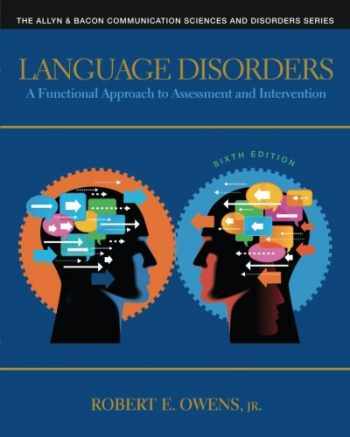 Acknowledged author Robert E. Owens Jr. wrote Language Disorders: A Functional Approach to Assessment and Intervention (6th Edition) (Allyn & Bacon Communication Sciences and Disorders) comprising 512 pages back in 2013. Textbook and etextbook are published under ISBN 0132978725 and 9780132978729. Since then Language Disorders: A Functional Approach to Assessment and Intervention (6th Edition) (Allyn & Bacon Communication Sciences and Disorders) textbook received total rating of 4 stars and was available to sell back to BooksRun online for the top buyback price of $84.89 or rent at the marketplace. Taking a functional approach, Language Disorders, 6/e focuses on children's language problems from a holistic perspective. Unlike other language disorders books, it moves logically from assessment through intervention emphasizing universal techniques that work for all delays and disorders. With over 1200 new references, it provides a strong theoretical background and emphasizes evidence-based practices. This edition includes a new chapter on early communication intervention, more on language analysis, coverage of Specific Language Impairment, and more on augmentative and alternative communication.